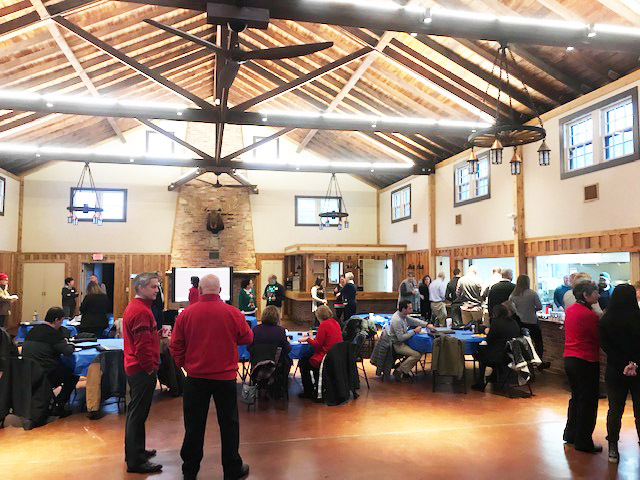 Heather Hill Care Communities sponsored Leadership Geauga's Human Services Day breakfast and lunch for more than 35 of Geauga County's influential leaders. Director of Food Services, Chef Jason Drago and Food Services Cook Justin Sarver prepared and delivered a mouth-watering selection of blueberry cream cheese and cake donut muffins, French Toast Maple Casserole and Egg Bake Strata in the morning at Centerville Mills in Bainbridge Township. These gentlemen outdid themselves only a few hours later at the University Hospitals Woodiebrook Educational Pavilion in Chardon, preparing an exceptional luncheon of Portabella ale vodka pasta and delicious confections of chocolate turtle brownies and a salted caramel-infused cake. Heather Hill Care Communities is a proud supporter of the Leadership Geauga program and the alumni who have participated in it. Congrats to the Class of 2019 and thank you for providing us the opportunity to showcase the talented culinary skills of Chef Jason and his outstanding Food Services Team! We love our community and how we can connect together. We are committed to the highest level of quality, customer service, and creating a "Culture of Care" - inside of Heather Hill and in our community as well. With strong Christian values and heritage, Heather Hill and its parent company, Foundations Health Solutions, are committed to serving our communities with the highest level of clinical excellence and resident satisfaction, along with a strong employee culture which places priority and resources on the direct caregiving team.